A Super-powered collision of extraordinary minds and vengeful intentions - V.E. 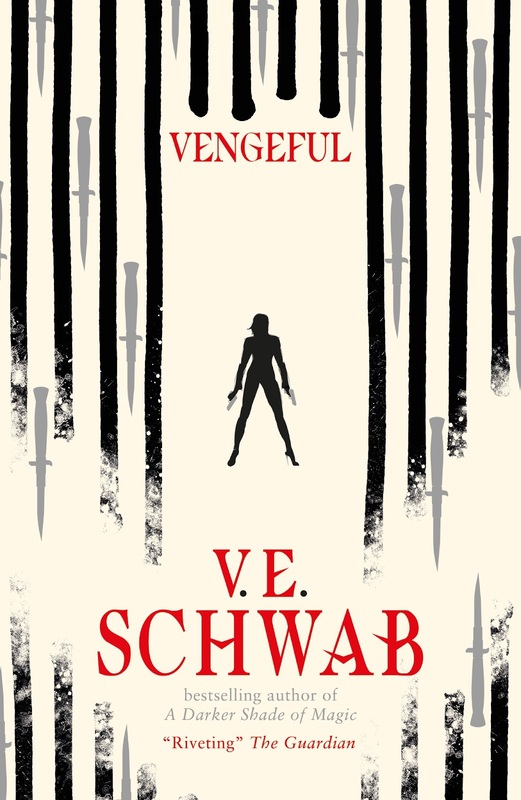 Schwab returns with the thrilling follow-up to Vicious. But Marcella Riggins needs no one. Flush from her brush with death, she's finally gained the control she's always sought - and will use her newfound power to bring the city of Merit to its knees. She'll do whatever it takes, collecting her own sidekicks, and leveraging the two most infamous EOs, Victor Vale and Eli Ever, against each other once more. 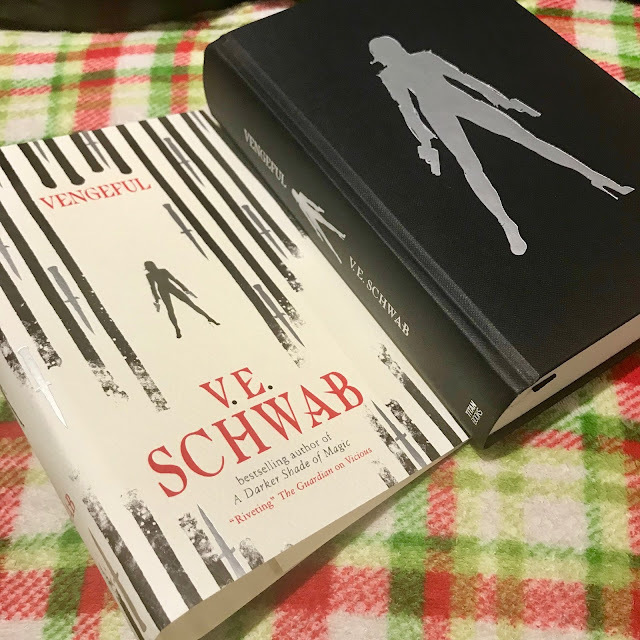 I absolutely loved Vicious so although the story worked well as a stand alone I was really excited when Victoria Schwab decided to revisit these characters in Vengeful. This really has been a series unlike anything else I've ever read and I still stand by my comment in my previous review that rather than being a series about anti-heroes it's more a series about characters who are varying levels of evil. There aren't really any good guys here, well apart from Sydney and Mitch that is, but since they follow everything Victor plans they aren't really innocent bystanders either. The main events in Vengeful are set about 5 years on from the end of the previous book but it's not told in a standard linear way so the timeline jumps about from one chapter to the next, we see parts of Eli's childhood, events from Vicious from different points of view and things that have happened to all of the main players in the years we've missed. I was worried I might find it confusing, especially since we have multiple narrators too, but it was actually so cleverly written that I had no problem following the story and I was about to really appreciate how the story gradually comes together as you start linking more and more of the different threads together. Eli has spent the last few years in prison, most of it being tortured but now in isolation helping the police with their enquiries while Victor, Sydney and Mitch have been hunting down EOs looking for answers to a problem that Victor is experiencing. New character Marcella has gone from mob wife trying to guide her husband's criminal career to vengeful woman looking for revenge and determined to take power for herself. We're introduced to a few other new characters, most of whom are looking out for themselves and never quite seem trustworthy, but you'll have to read the book for yourself to find out about all of them. Sydney and Mitch have long been my favourite characters in this, they're the only two who are somewhat innocent, they've crossed lines at times but they would rather not choose the path of violence. Victor has pretty much gone off the deep end though, he's dealing with some major issues but that doesn't really excuse his behaviour in this book even though you can kind of understand why he's making the choices he does. I still find Eli despicable but Victoria Schwab actually managed to make me feel a little bit sorry for him, not just for his childhood but also for the treatment he was receiving in prison. This world is just so complex and I love that all of the characters are shades of grey, nothing is simple and they've all done bad things, sometimes for good reasons but not always. I was totally rooting for Marcella when she started her bid for revenge against the person who tried to kill her but she ended up taking things far too far which made her much harder to like. It was pretty hard to root for anyone really but that's what makes it fun to read. 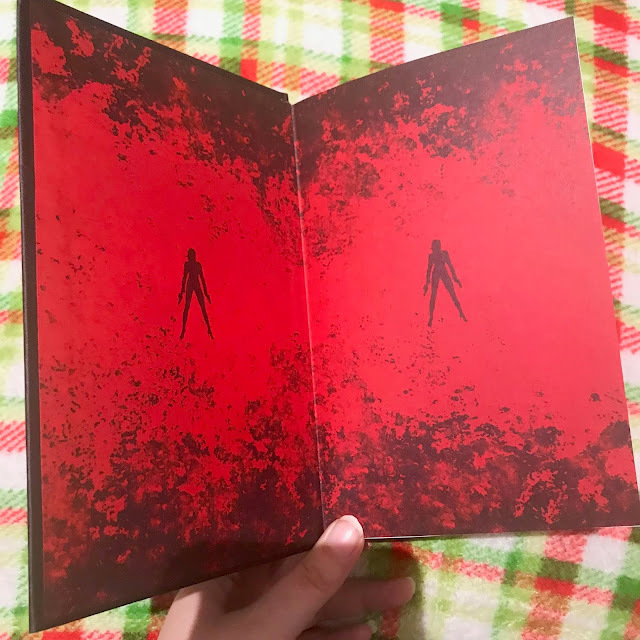 I have to finish this review by mentioning how gorgeous the UK hardback of Vengeful is, it matches the collectors edition of Vicious perfectly & is a great addition to my overloaded bookcase.